If dressing in a bold Italian fashion is how you like to roll. Color and unique style is important to you. That is why Fratello dress shirts are a brand that should be on your short list. Fratello dress shirts are designed in Italy and always made of unique fabrics that you just don't see every where. 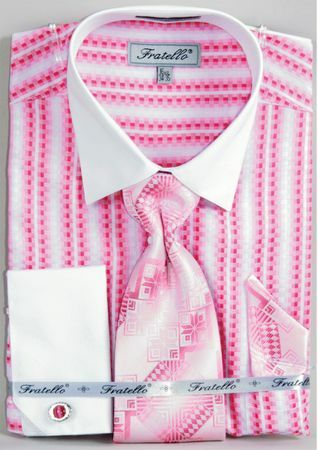 This head turning fuchsia color stripe dress shirt features french cuffs and collar that are solid color and comes with designer chosen tie and hanky set.